Is this the most sumptuous TV ever built? The big TV manufacturers have been talking about OLED technology for a long time now, and yet the largest screen size currently available is a somewhat pitiful 15-inches. And the price? An intestine-tangling £1,700. No, we can't afford one, either. 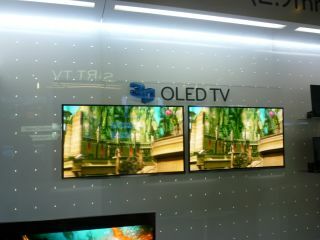 The superior picture quality of OLED (organic light emitting diode) TVs is achieved by passing an electric current through an emissive, electroluminescent film. This technique is thought to produce better colours and higher contrast and also enables screens to be extremely thin and flexible. The main drawback is that the tech is in its infancy, and so yield-rates are very low. It's very difficult to create pixel-perfect OLED panels without any flaws, and that means the prices of producing and therefore buying them is prohibitively high. However, LG has been tinkering with OLED tech for a while now and first showed off its 15-inch model, the LG 15EL9500 at IFA 2009. It went on sale only very recently and now we've been treated to a first look at the Korean company's stunning 31-inch effort. The differences between this larger OLED screen and the LCD and plasma efforts around it are immediately obvious. It's just so bright and vibrant. Full HD source material looks simply stunning – TV company's carefully choose what pictures they display on which displays at shows like this, and the choice to display colourful footage of flowers and trees, as well as animations worked a treat. 3D pictures also looked extremely impressive, with the added brightness over LCD equivalents making it truly stand out from the crowd. We can't praise OLED tech highly enough. It's just such a shame it's taking so long to make it into the homes of ordinary people.